A picturesque New England city, Greenfield is an ideal real estate opportunity for homebuyers. Located in idyllic Western Massachusetts and convenient to Springfield and Holyoke, Greenfield offers a historic housing stock, exceptional schools courtesy of the Greenfield Public School District, superb livability and easy access to Interstate 91, bus services, Amtrak and Bradley International Airport. 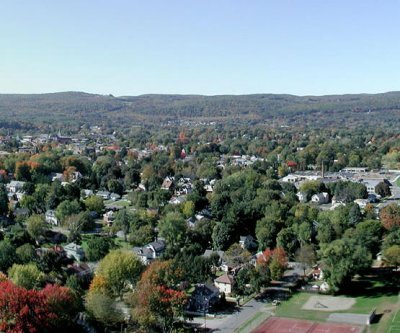 With its historic character and quaint New England charm, Greenfield is one of the top places to live in Western Massachusetts. Greenfield MA real estate offers strong property values and reasonable interest rates. Greenfield MA homes come in a wealth of choices, including historic homes, townhouses, starter homes and charming single-family homes in quiet neighborhoods. Greenfield homes and other Greenfield real estate options work well for families, commuters to Springfield, empty-nesters and young professionals alike. No matter what type of home you’re looking for, you’re sure to find it in this historic city filled with small town charm. Greenfield was first settled in 1686 by English colonists. Incorporated in 1753, it thrived as a mill town and major trading hub due to its strategic position near the Connecticut River. The 19th and early 20th centuries saw further growth as new railroads attracted immigrants from Germany and other nations across Europe. Today, Greenfield is a thriving, prosperous city that entwines its rich past with an eye for the future. It is known as one of the region’s most livable communities and offers superb public schools and a miniscule crime rate. Greenfield homes for sale are convenient to the Deerfield and Connecticut Rivers, making it an ideal place for anglers and boating enthusiasts. It also hosts a wide variety of parks, trails and public spaces to enjoy, just a few of which include Energy Park, the Green River Swimming Area, Highland Park, Green River Park and many others. Greenfield properties are close to many local attractions and sites of interest to discover. Parks and nature trails abound, including Green River Park and the bucolic Griswold Wildlife Reserve. Other great sites of interest in the city include the Greenfield Public Library and the Arena Civic Theatre. Nearby Springfield offers acclaimed museums and parks to explore while historic landmarks, nature trails and golf courses can be found all throughout the scenic Pioneer Valley. Local events include activities at the Greenfield Public Library, the Franklin County Fair and events at the Arena Civic Theatre. Those looking into becoming a Greenfield home buyer should contact Geri Johnson & Associates today for the best deals available in this quaint city. Homes for sale in Greenfield and other types of real estate in Greenfield offers some of the top deals in the Springfield metropolitan area. Contact Geri Johnson & Associates today for assistance with Greenfield MA real estate.